It’s been 14 years since anyone other than Moorhead or Roseau represented this section at the state tournament and those two powerhouse programs are seeded No. 1 and 2, respectively, this winter. Pick against tradition? It would be tough to do so, although neither team is without its flaws. Moorhead earned the top seed despite a mediocre record (11-9-2) thanks to a tough schedule and section victories over each of the other top six seeds. The Spuds have great experience and ability in net with senior Logan Marks and sophomore Michael Bitzer, but had to break in an almost entirely new defensive corps from last year’s state runner-up. Moorhead has three balanced lines that bring good speed and puck pressure, although no one has more than Brandon MacLeod’s 23 points. A month ago, Roseau (18-5-1) appeared on its way to the top seed, but then stumbled down the stretch with losses to Moorhead, Brainerd and St. Cloud Tech all in the last three weeks. The Rams have the scoring punch to make a run, as no line in the section is as powerful as a full-strength Adam Knochenmus, Shane Omdahl and either Cole Kostrzewski or Kevin Erickson. Brainerd (20-3-0) might have a chip on its shoulder, as many observers felt the Warriors would get the No. 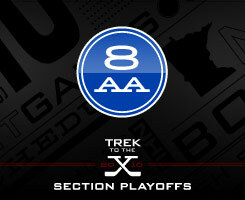 2 seed after beating Roseau on Feb. 5. Not that Jim Archibald’s club needs any more intensity, as the Warriors play with a hard-nosed, physical style that mirrors their coach. Watch out for senior goalie Reid Mimmack, a terrific athlete who could lead Brainerd to the state tournament. The best quarterfinal game should be between No. 4 Bemidji (13-11-0) and No. 5 St. Cloud Tech (15-9-0). They didn’t play during the season, but both are hoping for a semifinal rematch with Moorhead. Roseau certainly has firepower on its front line, which features the top scoring players in the section almost across the board. The Rams are happy to have leader Adam Knochenmus (pictured) back from injury and now skating back into midseason form. 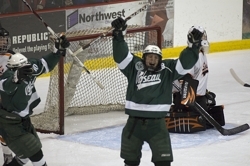 He was admittedly rusty at first, but he should pace Roseau’s offense. Moorhead is very balanced, but Quin Buckellew leads the Spuds in goal-scoring and has great puck control. He’s tough to knock off the puck and isn’t afraid to mix it up, nor is Brainerd’s tough Josh Archibald. Monticello’s Gage Torrel and St. Cloud Tech’s Brandon Reinholz are both youngsters who have been under-the-radar scorers, but could use the section tournament as a showcase for their skills. Section 8AA doesn’t have any elite college or pro prospects on defense, but plenty of solid players such as Moorhead’s Nate Thompson and Buffalo’s Buzz Tryggeseth, who leads the Bison in scoring from the blue line. The top three seeds all have goaltenders who can single-handedly carry their teams deep into the playoffs. Depending on which of Logan Marks (Moorhead), Reid Mimmack (Brainerd) and Ethan Kvidt (Roseau) comes up big, you might be looking at the section champion. The Spuds, despite their record, have to be the prohibitive favorite after taking care of business against the other top contenders in the last few weeks. Coach Dave Morinville can roll just too many balanced lines, which makes shutting down their offense impossible. The Warriors play a terrific style to make some noise in the bracket. With a hard-checking team and arguably the best goaltender in the section in Reid Mimmack, Brainerd can win low-scoring, playoff-style hockey games. The Warriors' only question marks are getting enough scoring and staying out of the penalty box.